Can we calculate the mass of a cluster of galaxies ? We could try to represent the mass of a cluster of galaxies with respect to the mass of the Milky Way. But the problem is that we do not really know the mass of the Milky Way. We have some approximations, but we do not even know the actual size of the Milky Way, nor the number of stars it contains. There is not really a consensus and different studies have provided figures that can vary enormously. 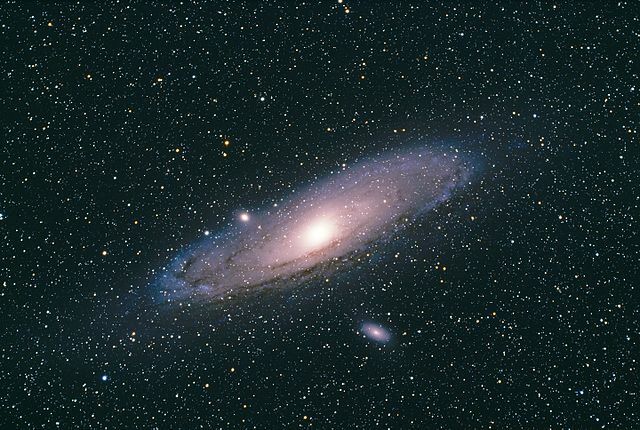 Our galaxy would have a diameter between 100000 and 180000 light-years. It would contain between 100 billion and 400 billion stars, and some estimates even evoke 1000 billion stars. With such ranges, a mass estimate does not have much interest. 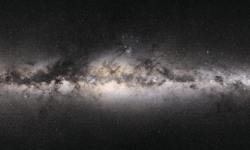 A study published in September proposes to estimate the mass of the Milky Way by observing the movement of peripheral galaxies. Dozens of dwarf galaxies orbit around our galaxy, such as the two Magellan clouds. With this method and using the data collected by Gaia satellite, the team in charge of the study has arrived at an estimation of just over 1000 billion solar masses. If we use this number, the cluster of galaxies Hyperion would have a mass 1000 times greater than the mass of the Milky Way. However, we must be aware that these estimates could be completely wrong. That’s why the sun is a good scale, because its mass is much easier to deduce from the orbit of the Earth. The mass of the sun is a little less than 2×1030 kg. Taking very long exposure shots, the Hubble space telescope has discovered very ancient galaxies that emitted light when the universe was only a billion years old. At this time of the universe, galaxies are small and unstructured. Over the following billions of years, gravity make them fatter and give them a more regular shape. The size of a galaxy with its hundreds of billions of stars already gives vertigo, but gravity also structures the universe on a much larger scale. It links galaxies together in clusters of galaxies and superclusters of galaxies. The Milky Way is part of a local group of about sixty galaxies. This group is itself part of the supercluster of the Virgin, which itself is part of an even larger structure, called Laniakea. The observable universe would thus contain millions of these superstructures, modeled on a large scale by gravity. 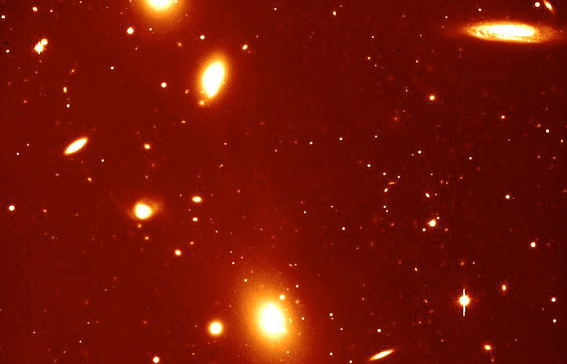 A team of European astronomers has observed with one of the VLT’s telescopes one of these gigantic super-clusters of galaxies, and they called it Hyperion. The age of Hyperion makes it special. To estimate how long a light has left its source, astronomers measure its shift toward red. The further away the source is from us, the more the light will shift towards long wavelengths, by Doppler effect. As the universe is constantly expanding, a light that appears to us as redder than we would expect is very old. The light of Hyperion comes to us with a great shift to the red. This allows us to estimate that it was already created only 2.3 billion years after the Big Bang. This is the biggest structure we have seen in such a young universe. Its mass has been estimated at 1 million billion times that of the sun. It’s a bit of a surprise to find such a huge structure within a still young universe. As with young galaxies, it was thought that it would take a few billion extra years of gravity to order matter in this way. Hyperion has a very complex structure, it contains at least seven regions of high densities. 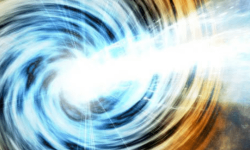 They are interconnected by filaments, themselves made of galaxies. Its structure is however quite different from that of the clusters of galaxies observed closer to us. The distribution of matter in Hyperion seems fairly uniform. The clusters of galaxies that have had time to evolve have a structure that is tightening and densifying. Given its age, Hyperion will probably have the same fate. It is in any case a valuable observation to understand the evolution of the universe at the largest scales. The super-clusters of galaxies are indeed part of the largest known structures in the universe. They can span distances of billions of light-years. The Great Wall of Hercules-Boreal Crown is thus the largest known structure that is bound by gravity. It is a galaxy filament 10 billion light-years long, 900 million light-years thick. It probably contains billions of galaxies.